We’ve reached a cynical new perspective on the mobile payment app Venmo: It opens up new forms of passive aggression. It emboldens your craven, confrontation-fearing friends to invoice you for goods, this argument goes, goods that you might once have assumed had been given out of generosity. This is probably more an issue with your craven, confrontation-fearing friends than the technology that lets you smoothly settle debts without relying on the old memory-based balance sheet, which has a way of selectively omitting items. Technology messes us up in all kind of ways, to be sure, but this isn’t that. If anything, Venmo drags to the surface whatever petty resentments were lurking all along. To take this Quartz story’s most disconcerting example: your friend invites you over to watch some TV and talk, pours you a glass of wine, and then hits you with a $6.00 request. A friend like that was likely seething behind a smile with every casual wine pour, even before downloading Venmo. So face that bitterness head-on. 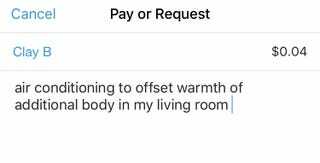 Let the next miserly Venmo request serve as the impetus to start communicating clearly and tactfully about spending money with your friends, which isn’t easy, but is probably a large part of being a socially functional adult. “Tastefully avoid talking about money” is not a social grace worth keeping around for many reasons, but especially because it tends to punish those with less money. One overdone-but-still-true example: Wordlessly splitting the check might have a grad student who strategically ordered soup subsidizing his private equity pal’s jewel-encrusted truffle-oysters. Initially it might feel icky to make every social outing explicitly about the transactions, but that same ickiness drives people to never addressing these issues directly, which feeds more resentment on one side and more obliviousness on the other. If the choice is between normalizing money-talk versus repressing it for fear that it will taint the purity of your sacred hangout session, then I’m working towards the former. The Quartz piece, like many others, overstates the degree to which not talking money helps friendship feel so good and right. If you are as clear with your friends about money as you are about all other emotional or intellectual issues, then this kind of repression will eventually no longer feel like a virtue. And you will also stave off the possibility of class conflict among your friend group! Sounds great. Let these three true statements guide your actions: generosity flows both ways in a good friendship; people are differently able to afford financial generosity; people should assume that they are paying for exactly what they’re ordering.